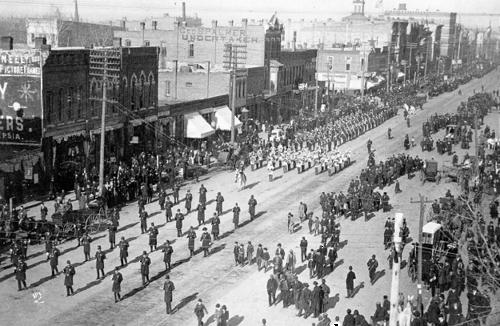 An elevated view of the funeral procession of Senator Preston B. Plumb in Topeka, Kansas. A band dressed in white uniforms is pictured in the center of the photograph. Also visible are crowds of spectators, horse-drawn carriages, utility poles and power lines, and buildings and businesses along the city street. Government and Politics - Federal Government - Congress - Senate - Plumb, Preston B.